Unless otherwise stated, the material published on this website is Copyright © 2014-2019 Thurstons Brewery. All rights reserved. 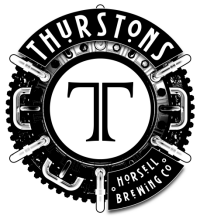 Content may not be reproduced, in whole or in part, without first obtaining the specific written permission of the Thurstons Brewery webmaster. Every effort is made to ensure that the information contained within the Thurstons Brewery website is accurate. However, Thurstons Brewery makes no warranty, representation or undertaking whether expressed or implied, nor does it assume any legal liability, whether direct or indirect, or responsibility for the accuracy, completeness, or usefulness of this information.